Nice day, started with my morning (5K) walk around Albany. Around noon the visitors started arriving. I gave two tours, both groups were of nice size (10-12 people). The 2nd group had was a little tough. It included a mix of visitors who wanted to quiz the docent, and a number of over anxious kids. This is a tough combination. It's hard to give justice to difficult questions without losing control. Unfortunately one parent decided to cut the tour short because of behavioral issues. One question I was asked was "How far does the 3 inch gun recoil?" I held up my hands and said about this far (roughly a foot). 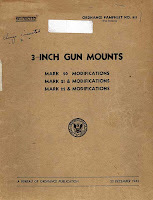 Fortunately, the Historic Naval Ship Association, has digitized the 3" Gun Manual so it's pretty easy to check, on page 25 of Ordnance Pamphlet No. 811 (12/22/1943) there is a table and the precise answer is 11 - 1/2". The second question occurred on the signal bridge. Time permitting, when visitors are at the Slater's Search Light, I usually tell the story of the USS Cecil J. Doyle and the rescue of the crew of the USS Indianapolis. I also noted that before it was sunk the USS Indianapolis delivered the A-Bomb dropped on Hiroshima. That seemed to be a point of contention. I was told by one of the visitors that the bomb delivered by the Indianapolis was a ruse. He heard this from someone stationed on Tinian. Since then I have checked multiple sources and this appears to be untrue. 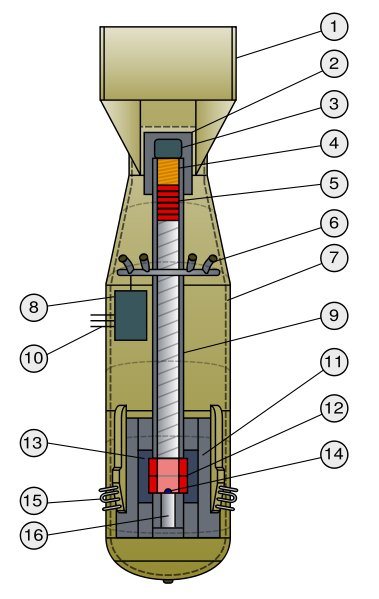 The Nuclear Weapon Website had a very detailed (and well documented) article on Little Boy (including transport) - The first U-235 projectile component was completed at Los Alamos on June 15, 1945. Casting of the U-235 projectile for Little Boy was completed on July 3. On July 14 Little Boy bomb units, accompanied by the U-235 projectile, were shipped out of San Francisco. They were picked up by the USS Indianapolis (CA-35) at the U.S. Navy's Hunter's Point shipyard at San Francisco on July 16, bound for Tinian Island in the Mariana Islands. On July 24 the last component for Little Boy, the U-235 target insert, was completed and was tested the next day. The Indianapolis delivered Little Boy bomb units, and the U-235 projectile to Tinian on July 26. On the same day the target assembly, divided into three parts flew out of Kirtland Air Force Base, Albuquerque on three C-54 transport planes, which arrived July 28 at Tinian. However, I can see how this rumor can arise. While the Indianapolis delivered the majority of the weapon, several components were delivered by plane several days later. The air delivered components were the U-235 Target Assembly, which I believe is item 13 on the drawing. It appears to me that the separation of the Target Assembly was driven by the unstable nature of the bomb, and perhaps for security reasons. It's relatively easy to see how the scuttlebutt associated with these deliveries by plane, could lead to the speculation that the Indianapolis delivered a fake bomb. 5/9/2010 - Tulip Festival or bust!